Montevideo is the capital of Uruguay, and the country's largest city. It serves as a transportation hub for accessing the rest of the country, as well as Buenos Aires. Here you can sample everything Uruguayans are passionate about: steak at Mercado del Puerto, sipping mate, soccer matches, and walks along the beaches and boardwalk. Heading to Montevideo? Book your hostels here! Montevideo is served by the Montevideo Carrasco International Airport (MVD), which is situated about 15 km North of the city. Flights to/from Buenos Aires take less than an hour, but it's cheaper and easier to take a ferry. Three companies run ferries between Buenos Aires and Montevideo. To save money, book in advance online. Buequebus: The nicest boats, and the most expensive fares. A one-way, economy ticket on the fast ferry costs about $55. If taking the catamaran-style ferry, the transit time is 1 hour 15 minutes, and there's WiFi on board to help pass the time. Colonia Express: The middle option, in terms of both quality and cost. Seacat Colonia: The least expensive option. Terminal Tres Cruces is the main bus station in Montevideo. A ride from the terminal to the historic (old) city center is 148 pesos ($7.50). A city bus costs just 11 pesos ($0.55). Because Uruguay is so small, it's easy to catch a bus during the day, anywhere in the country, without planning ahead. Most bus lines have reduced schedules on Sundays. $11– From Colonia to Montevideo (on COT). 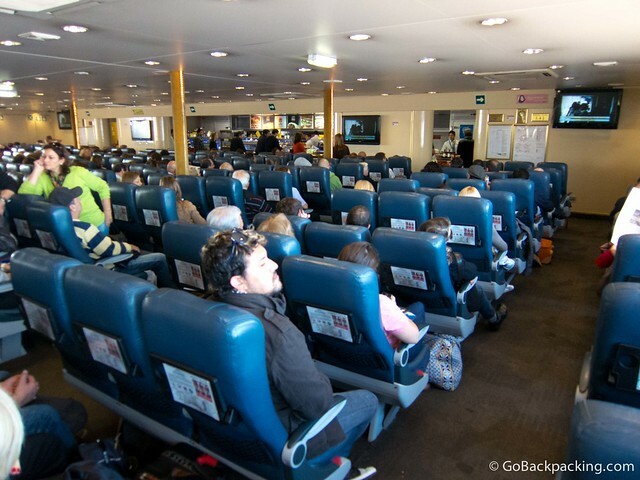 $10 – From Montevideo to Punta del Este (on Copsa ESTE). $17 – From Montevideo to Castillo, near Cabo Polonio (on Rutas del Sol). Montevideo, like Buenos Aires, is generally quite safe. One glaring exception is the area around the port in the old city center, which is notoriously dangerous, and should be avoided. You'll find neighborhoods like the old city center, Palermo and Pocitos to be walkable, however you'll probably want to use taxis or mass transit to get around the city at large. 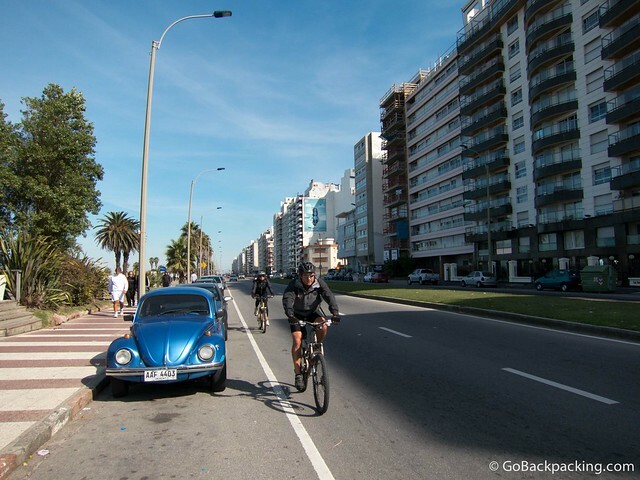 Renting a bike and going for a ride along the 22-kilometer Rambla (boardwalk) is a very Uruguayan way to spend the day. Taxis are metered, however the number that appears on the meter is not the actual cost. Instead, the driver will cross-reference a chart to determine the fee. Like in Buenos Aires, taxi rides can be expensive, especially compared to the low cost of city buses. 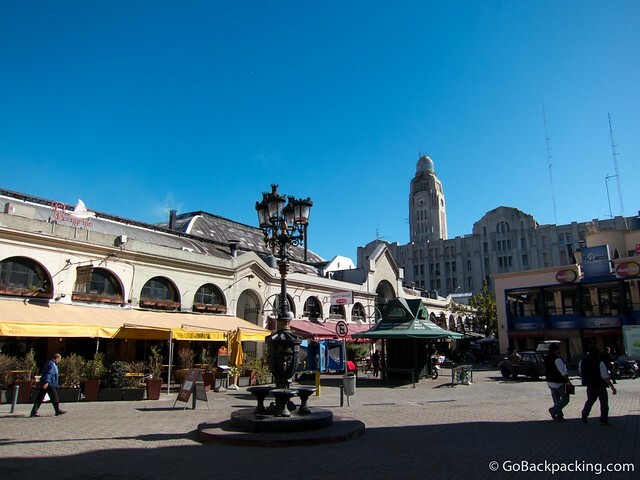 $7.50 – From Terminal Tres Cruces to the old city center. $10 – From Pocitos to the old city center. Local city buses can take you most places in Montevideo for a fraction of the cost charged by taxis (under 20 pesos, or $1). The catch is you'll have to find out which one to catch, and where. Ask at your hostel or hotel. There are two main options when picking a hostel, the old city center and Pocitos. Whichever place you choose to stay, I'd still recommend visiting the other. Hostels in the old city center are walking distance from the port, and many points of interest. There's also a lively bar scene. It can feel and be a little sketchy at night, and on Sundays and holidays when the city center is literally deserted. Pocitos is a more upscale neighborhood located East of the city center. It's safer at night, and features direct access to the boardwalk (La Rambla) and beach by the same name. It's generally a more pleasant place to stay. Most hostels in Montevideo, and Uruguay, include a basic breakfast with cereal, bread (jam, butter, dulce de leche), coffee, tea, milk and juice. Arriba Hostel – Roque Graseras 739, Pocitos. Two blocks from the beach. 6 and 10-bed dorms. El Viajero – Ciudad Vieja – Ituzaingo 1436, old city center. This is where I stayed. It's 2 blocks from Plaza Independencia, and a 10-minute walk to Mercado del Puerto, but it is also a few blocks from the port, so you have to be careful not to walk in that direction, especially at night. Friendly service, small dorm rooms. WiFi is strongest on the main level. Unplugged Hostel Pocitos – Luis de la Torre 930, Pocitos. Also a few blocks from the beach. Part of a chain of hostels in Uruguay. Unplugged Hostel Suites Centro – Colonia 2063, old city center. If you're planning to live in Montevideo, it'll be cheaper and easier to rent a room or apartment. Craig's List has a few advertisements. Ask around, starting with the hostel staff. There is a small Couchsurfing community. Beaches – There are several beaches to choose from with Pocitos being one of the nicest, and most easily accessible from hostels. All of Montevideo is located along La Plata River (not the Atlantic, which begins at Punta del Este a few hours East.). Ciudad Vieja (Old City) – Plaza de Independencia is located at the end of Avenida 18 de Julio, a major road through the city. Here you can see Mausoleo de Artigas, a mausoleum and monument in the center of the plaza (which was under renovation when I visited in May 2012). 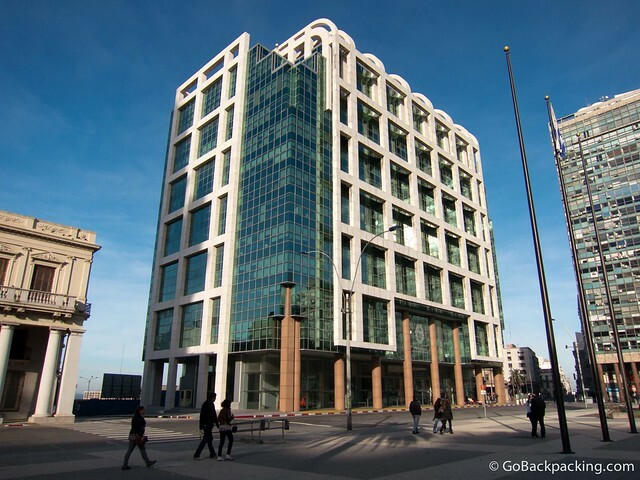 A large, modern office building facing the plaza is where the Uruguayan government and President are located. In addition, there is an old palace. Historic Teatro Solis (theater) is located just off the plaza. Half-Day City Tour – For 540 pesos ($27) you can take a 3-hour city tour that visits various points of interest around the city. It's an easy way to get your bearings, but with only about 10 minutes at each stop, it's mostly an opportunity to get some photos. The tours start in Plaza de Independencia at either 8:30 AM or 2:30 PM daily. I went on the tour, and wouldn't necessarily recommend it. Interesting places included a drive by the President's home (which was hidden behind bushes), Palacio Legislativo (Parliament building), and Carrasco, the wealthy suburb where many of the football players live. La Rambla (Author's Pick) – On weekends and holidays, Uruguayans love to go for walks and bike rides along the boardwalk, named La Rambla. Many more enjoy simply sitting and sipping their mate. This 22 km boardwalk starts in the old city and runs East along the city's coastline. Allow 2-3 hours if you want to walk between the old city center and Pocitos. Mercado del Puerto (Author's Pick) – A covered market filled with restaurants. This is THE place to go for steaks and various meats in the city, as much for the old world ambience as the quality of food. The restaurants inside are only open for lunch, and begin serving as early as Noon, while the restaurants with outdoor seating are also open for dinner. In 2008, Anthony Bourdain taped a lunch at Mercado for the Uruguay episode of No Reservations. Museums – There are a lot of small museums, most notably MAPI (Museo de Arte Precolombiano y Indigena), and Museo Torres Garcia, which is dedicated to Uruguay's most famous artist. 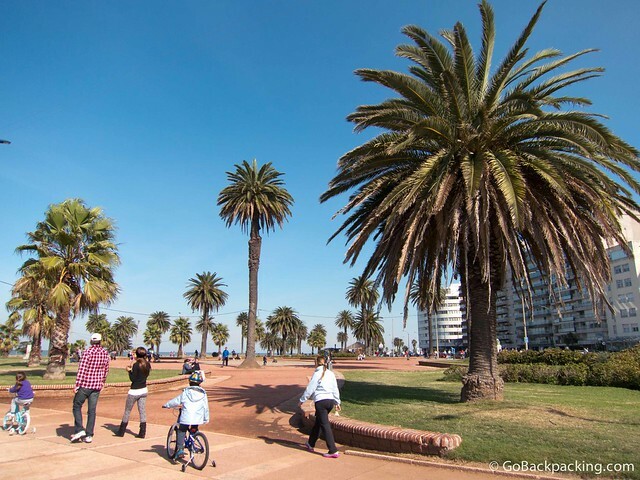 Pocitos – A cute neighborhood for walking around and shopping, plus it features a stretch of La Rambla, and one of the nicest beaches in Montevideo. 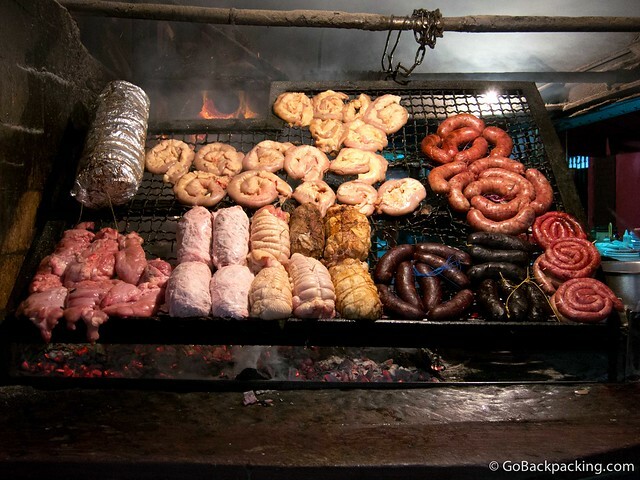 The highlight of Uruguayan food can be summed up in one word: meat. Some say it's even better than the meat served in Argentina. Given the long coastline, fresh seafood is also available everywhere. Bar Montevideo – Located at the West end of Pocitos Beach, this restaurant offers nice views of the water, with a mix of indoor and outdoor seating. Chiviteria Marcos – Luis de la Torre 895, Punta Carretas. This restaurant chain serves up the classic Uruguayan sandwich, the chivito. This location was featured on No Reservations. Don Pepperone – Multiple locations in the city, and country. Typical pub atmosphere, offering chivitos, pizza, pastsa, steaks, etc. The location one block from Plaza Independencia is 3 levels, and looks like it could be a fun bar on the weekends. Mercado del Puerto – A dozen restaurants inside, with several more surrounding the perimeter, a visit to this meat market is a must. It's not cheap, but the quality and atmosphere are one-of-a-kind. A small filet mignon with French Fries, and a glass of medio y medio wine cost me 535 pesos ($27) at Cabana Veronica. Tony Bourdain ate at La Estancia del Puerto, but it was closed when I was there. Are you familiar with the Montevideo nightlife scene? Please contact me here to send me a few more recommendations. Include the name of the bar, address if you know it, website address (if one exists), and a sentence or two describing the vibe, music, and why it's cool. Gracias!